Sing and Sign - What is it? Sing and Sign... what is it? So what is baby signing? As a part of typical development before speech is well established, babies naturally use a combination of gestures and sounds to help their parents understand them. For example they may point, shake their heads, clap their hands and wave "bye-bye". Now is a good time to introduce some extra gestures to help your baby communicate. It's easy to do and your baby will really enjoy it! Why not try milk, more, change nappy, or tired? Baby signing is wonderfully rewarding and fantastic fun. You will be amazed by what your baby is capable of telling you before being able to talk! How does Sing and Sign teach these baby signs? Sing and Sign's original and unique approach has revolutionised baby signing in this country. Everyone knows nursery rhymes and action songs are great fun and musical activities help stimulate language development. Sing and Sign combines the benefits of both music and baby signing. We teach a wide range of signs using some traditional and some specially written or adapted songs. What makes Sing and Sign special is that every sign used in song relates to those important first words of a baby's world! Nappies and bath time, hiding games and bedtime. You name it, we have a song about it, and the babies just love to hear them! With a high standard of educational content, this is a relaxing, enjoyable and unpressured way for you and your baby to learn. Which signs do we use? Our signs are widely used by Speech and Language professionals, nurseries and schools across the UK. Sing and Sign was initially inspired by the West Sussex sign support system 'Say It and Sign It' and you are likely to recognise the vast majority of our own signs also being used in your baby's future nursery and/or school, or by a young friend with special needs, or by a young fan of BBC TV's Mr.Tumble! Simple keyword signing (always alongside speech) has long been used by Speech and Language therapists to encourage communication of course, and is now also widely used in mainstream education in many early years settings across the UK. The signs your baby learns in Sing and Sign classes (or from our DVDs) will be largely compatible. Sing and Sign teaches keyword signing (always with the spoken word) at the one-word level, which is appropriate to the age group. 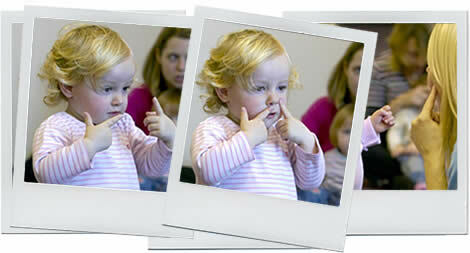 If your baby is deaf, you may have been advised to learn British Sign Language. BSL is a complete language, which includes grammatical structure and Sing and Sign recommends you learn this wonderful language via an accredited BSL course, if this is more appropriate for your child's needs.